WILLEMSTAD - Prime Minister Eugene Rhuggenaath had an introductory meeting with the new Director of the oil refinery Isla, Mrs. Vanessa Flores. The Vice President of the Venezuelan State Oil Company PDVSA, Mr. Guillermo Blanco was also present. The meeting between the parties took place in a pleasant and casual atmosphere, and from both sides, the wish was expressed to continue to work together even after the current rental contract has expired in 2019. This in view of the good business but also cultural that has tied the neighboring countries together for decades. Prime Minister Rhuggenaath has indicated that there is a signed contract with Guangdong Zhenrong Energy (GZE) but that the agreement also provides space for a cooperation with PDVSA. The Vice President of PDVSA Guillermo Blanco has confirmed that the relationship between the two countries and the refinery is also of great importance to Venezuela. It was agreed to make a follow-up meeting at the political level between Prime Minister Rhuggenaath and his Venezuelan counterpart in the short term. 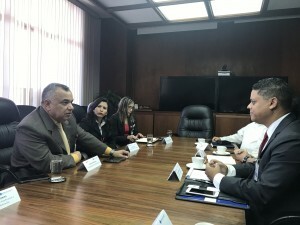 The Venezuelan Government is setting up a negotiating team to continue the discussions with the MDPT for the possible participation of PDVSA in the future of the refinery. 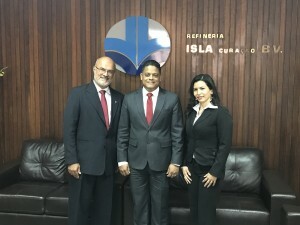 Also, Prime Minister Rhuggenaath exchanged thoughts with Isla’s new CEO about how the relationship between Isla, PDVSA and the government can be strengthened in the coming years.